I created this recipe for the “Your Best New Year’s Resolution Dish” contest at Food52. Though this tarte tatin is not the slightest bit healthy (due in large part to a crust eerily reminiscent of shortbread), it’s one way of meeting my New Year’s resolution of eating locally. This recipe made it a delight to eat rutabaga and chard- vegetables that I might otherwise not know how to prepare, and therefore avoid. Combine the flour and salt in a small bowl. Scatter the diced butter over the flour and cut in with a pastry knife until the butter is well incorporated. Add the beaten egg and mix with a fork until the mixture starts to come together. Use your hands to quickly form the mixture into a 4″ disk, wrap in plastic wrap and refrigerate 30 minutes. Don’t worry if the dough seems a little dry, everything will work out just fine! While the pastry is chilling, preheat the oven to 400 degrees. 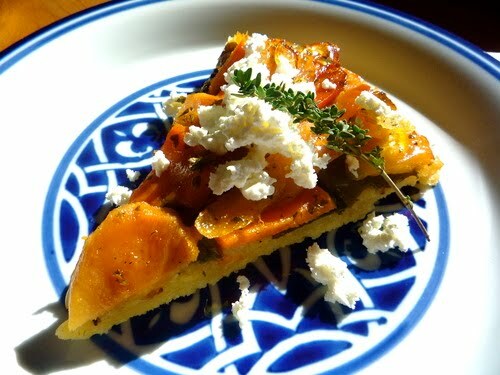 Line a baking sheet with parchment paper and toss the sliced sweet potato, carrots, onion, rutabaga and olive oil. Spread them out evenly on the baking sheet and sprinkle with kosher salt and freshly ground pepper. Roast for 30 minutes, or until the vegetables start to brown. Remove from the oven and let cool slightly. While the vegetables are roasting, roll out the pastry on a well-floured work surface into a 12″ circle. Start rolling from the center of the disk and add more flour to the underside of the pastry periodically to keep the dough from sticking. Lightly flour the underside of a baking sheet and carefully transfer the dough onto it, to make it easier to slide onto the vegetables in a bit. Melt the butter in a cast iron skillet over medium heat. Add the lemon juice and honey and stir until the mixture is combined and bubbly. Remove from the heat and stir in the lemon zest and thyme. When the roasted vegetables are cool enough to handle, begin layering them, along with the uncooked baby chard, on top of the glaze in the cast iron skillet. The tarte will be inverted, so you should spend some time making the bottom layer look pretty. After you’ve layered the bottom layer you can just dump the rest of the vegetables on top unceremoniously because no one will see that part. Reduce the oven temperature to 375 degrees. Slide the pastry from the baking sheet on top of the vegetables in the cast iron skillet, and put the skillet in the oven. Bake for 30 minutes, or until the crust is lightly golden brown. Remove from the oven and allow to sit for 15-20 minutes before inverting onto a plate. I highly recommend that you serve each slice with crumbled chevre!